Often considered immortal, the freshwater Hydra has a prodigious regenerative power, discovered by the Geneva naturalist Abraham Trembley nearly 300 years ago. Any fragment of the body with a few thousands of cells can regenerate the entire animal, which measures about one centimeter. “Regeneration of the head relies on the transformation of the stump into a tissue called the head organizing centre, which has developmental properties and, like an architect, directs the construction of the future head”, explains Brigitte Galliot, professor at the Department of Genetics and Evolution of the UNIGE Faculty of Science. The head organizer carries out two opposite activities, one activating and the other inhibiting. The first induces the differentiation of stem cells into specialized head cells. The activator is a growth factor called Wnt3, whose action allows the initiation of a three-dimensional cell differentiation program that enables the construction of the head. Thus, in the absence of Wnt3, the head regeneration program cannot proceed. The inhibitory activity, produced under the control of the activator activity, prevents the formation of supernumerary heads. “These two antagonistic activities establish a dialogue between them, but we knew neither the identity of the inhibitor nor the nature of this dialogue”, says the biologist. Using the results of a study conducted by a German team on the planarian flatworm, the biologists developed a gene screening strategy to identify this inhibitor. “We started from 124 candidates who met specific criteria to single out a unique winner, who met all of them. It is a gene that codes for a protein called Sp5”, says Matthias Vogg, researcher at the Department of Genetics and Evolution of the UNIGE Faculty of Science and first author of the study. The scientists then demonstrated that Sp5 binds to the regulatory region of the gene that codes for Wnt3, blocks its expression and thus the formation of the head. How does the dialogue between the activator pathway and the inhibitor work? 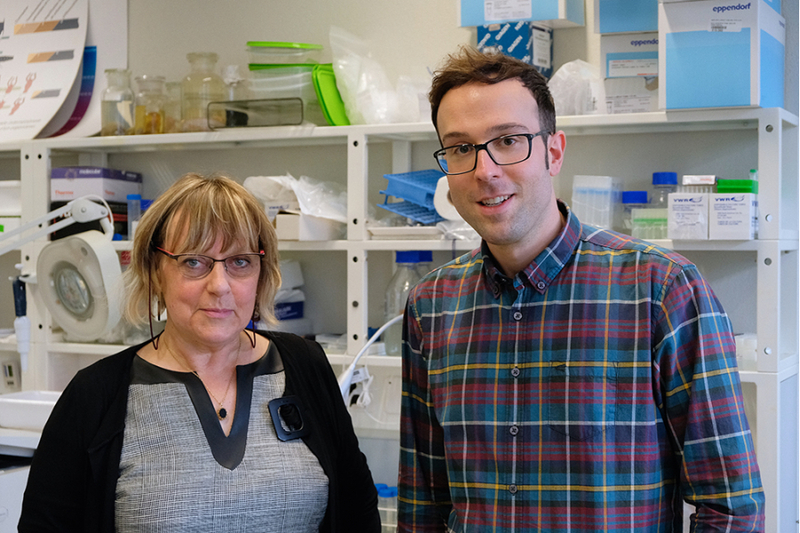 “We have quantified the expression of the genes encoding Wnt3 and Sp5 in different parts of the body of intact or amputated Hydra, and discovered that a regulatory loop between the two activities is established according to the location and quantity of each gene expressed”, notes Brigitte Galliot. Thus, in intact animals, the growth factor Wnt3 will be mainly present at the tip of the head, while Sp5 will be primarily active in the surrounding area, to prevent the appearance of other heads. When researchers block the expression of Sp5, Hydra polyps, intact or regenerating, develop multiple heads, all perfectly functional, their tentacles apprehending the food to lead it to the mouth. “We also replicated these results from Hydra polyps whose cells had been completely dissociated from each other, then reaggregated and left in culture: multi-headed Hydra re-formed completely in four to five days”, explains Matthias Vogg. In humans, the cell signalling pathway activated by Wnt3 is mainly active during embryonic development, as well as in different types of tumors in adults. If the inhibitory effect of Sp5 is confirmed in our species, this protein could be a candidate treatment targeting cancer cells that use the Wnt3 pathway to proliferate.